These bushes were fabulous! Over six feet tall and loaded with berries. In just 30 short minutes I managed to pick two and a half pounds of plump delicious berries. As I was picking I was hearing parents with small children scattered throughout the field. I laughed to myself as I remembered blueberry picking with my girls when they were little. The three of them were more interested in eating the berries. They would pick for a while, eating as they picked, and then when they were tired of picking they would come raid my blueberry bucket for handfuls of sweet berries. Quite frankly I never managed to pick enough to satisfy three hungry tummies and have some for home. I often had to go back without them in order to have a reasonable amount of berries. I consider blueberries super-fruits, very high in antioxidants they are one of the few native American fruits. I’ve written about some of their health benefits in the past. New research appears to show that higher consumption of blueberries may be helpful in warding off conditions such as Alzheimers and Parkinson’s as well as improving general cognitive function in aging adults. Whatever their health benefits, no one can deny that they taste wonderful. After my husband and teenaged daughter plundered the batch I brought home I had just enough left to make a gluten free blueberry coffee cake. Obviously I’m going to have to go back for more….I guess some things never change. *Sid did share that he uses roundup for weed control (obviously not on the blueberries) because it is a short-lived weed killer. I’m hopeful that he will consider switching to something else like vinegar which is shown to be effective. I just got back from the annual conference of the National Association of Nutrition Professionals. It was a fabulous two day event, lots of wonderful conference sessions, catching up with friends, making new ones, and great food (of course, what else would one expect at a conference of nutrition professionals). I attended sessions on a wide range of diverse topics from “Dietary Triggers of Pain and Inflammation” to “Nutrigenomic Regulation of Adaptive Stress Response” to “Fermentation Around the World” and I was struck by the fact that one word kept coming up over and over again. Turmeric. It truly was THE word, not just of the day, but of the weekend. One seminar that I took with Agnes K. Green of The Healer Within Us even referred to turmeric as a “major mojo” herb. I think she’s right; examining all the wonderful benefits of turmeric it’s easy to see why it is gaining such popularity. 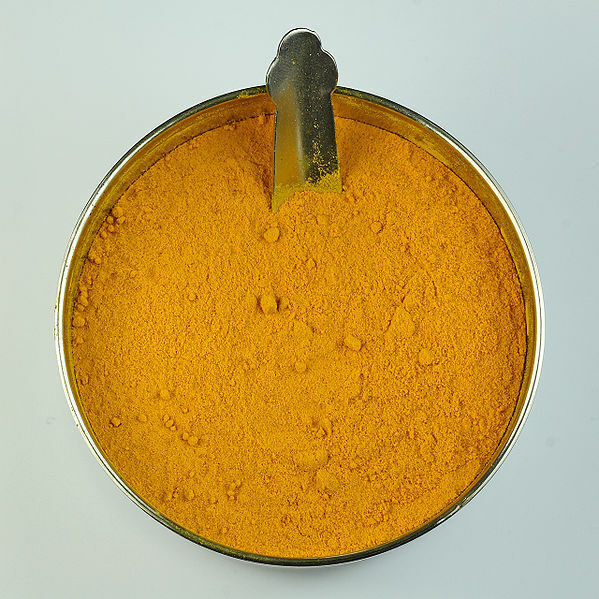 Made from the root of the Curcurma longa plant, turmeric is a power anti-inflammatory herb. It has uses ranging from treating flatulence, colic, jaundice, and bruises to being helpful for IBS, rheumatoid arthritis, and is now being researched as a powerful anti-cancer ingredient. High in manganese, B6, iron, and potassium it gives a pleasant kick to recipes with it’s warm, distinctive flavor. Although most commonly thought of for curries, it goes well with many dishes, such as egg salad, rice salads, lentils, soups, pickles, and relishes. Some folks even use turmeric to make a tea. According to Dr. Andrew Weil, Okainawans, noted for being remarkably long lived, “drink copious quantities of turmeric tea.” In addition to the other health benefits mentioned above studies are showing that turmeric has some effect on reducing the inflammation of brain tissue associated with Alzheimer’s. Major mojo indeed. and plan to start experimenting more in the kitchen. If you’ve got any particularly tasty recipes that you’d like to share, please feel free to pass them along, we could all use a little more of this beneficial herb in our diet. I recently had a wonderful sandwich made with a soft cheese and raw chayote squash on a crusty french bread. The crisp fresh flavor of the chayote complimented the soft cheese and gave the sandwich a wonderful consistency. Chayote (pronounced chai-oh-tee) is a member of the curcurbitaceae family, which also includes melons, cucumbers, and squash. Sometimes call a pear squash it can be eaten either raw or cooked. Nutritionally it is an excellent addition to your diet, being very low in calories, only 25 per cup, with a high level of vitamin C, folate, and manganese (a mineral that is important for bone growth). That one cup also provides a modest amount of protein and 2 grams of fiber. It is believed to have diuretic properties and apparently there are Central American cultures that use it to treat kidney stones and other urinary disorders. Currently at their peak they can be added to a wide range of raw salads or cooked dishes. Consider trying this wonderful recipe from Epicurious. 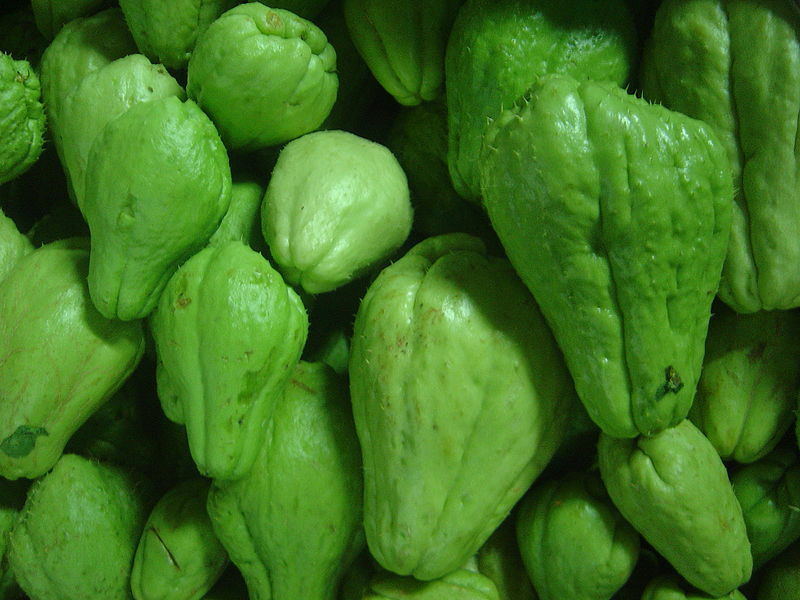 When choosing a chayote in the grocery store or farmer’s market make sure to choose a firm unblemished fruit. According to an article I recently read, the baobab is the next superfruit. I imagine this means it should be hitting the shores of the USA any day now. No doubt to be found in a wide variety of items at the grocery store. Apparently the fruit has extraordinarily high levels of vitamin C, nearly six times that of an orange. It is also reported to be high in calcium, potassium, and both soluble and insoluble fibers. The fruit is also anti-inflammatory and antipyretic (fever reducing). In addition to all of the wonderful benefits of the fruit, many other parts of the tree are usable. These include the seeds, fibers, and leaves. These other products are apparently sometimes used in cosmetics and folk-medicines. Once they come to the United States they will no doubt find their way into every imaginable product. While I am always happy to find foods that have great nutritional benefit or plants that have beneficial value, I confess to being underwhelmed at the thought of another “super” food. From açaí to goji berries to mangosteen and more, every new discovery brings a touted superfood. These are delivered to us at an enormous premium and pushed into our everyday consciousness via massive marketing campaigns to try to convince us to buy a product, any product, that has this newest discovery in it (sometimes in the most minimal quantities). In addition to the push by producers to include the newest, latest, greatest thing, by consuming, and often over-consuming, whatever this newest product is. Sometimes to the detriment of those who produce it. One prime example of this trend is what has happened/is happening in Peru with the rise in popularity of quinoa. Farmers, feeling pressure to produce, are depleting the soil that would otherwise have an opportunity to lay fallow and recover. They are also switching not using the natural llama fertilizer as they reduce their herds to allow them to grow more quinoa. In the long run this quite possibly may lead to a reliance on chemical fertilizers which is not the best option for the soil or the plants. While it’s interesting, and tasty, to have the availability of superfoods from other parts of the planet, don’t lose your awareness of what is available around you. Before you rush off and buy the latest baobab concoction, think more about what you eat on a regular basis. Blueberries, sweet potatoes, avocados, liver, and pumpkin seeds are among just a few of the wonderful and delicious superfood that are available in the United States. If you live outside of the US consider looking for those nutrient dense foods that are available closer to home. Improving daily nutrition is better for long-term health than jumping on the latest-and-greatest bandwagon. Spending your food dollars for overall health, such as fresh, local, organic food is better than spending a large sum for a small quantity of any food, no matter how super it purports to be. Remember to eat well from the abundance that surrounds you.